Zrenjanin (Serbie Cyrillic: Зрењанин, pronounced [zrɛ̌ɲanin]) is a ceety locatit in the eastren pairt o Serbien province o Vojvodina. It is the admeenistrative centre o the Central Banat Destrict o Serbie. 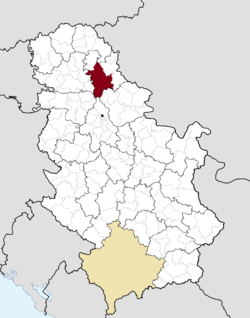 The ceety's population is 75,743, while the Zrenjanin admeenistrative aurie haes 122,714 inhabitants (2011 census data). Zrenjanin is the lairgest ceety in the Serbie Banat, the third lairgest ceety in Vojvodina (efter Novi Sad an Subotica) an the saxt lairgest ceety o Serbie. This page wis last eeditit on 3 Mey 2018, at 18:03.